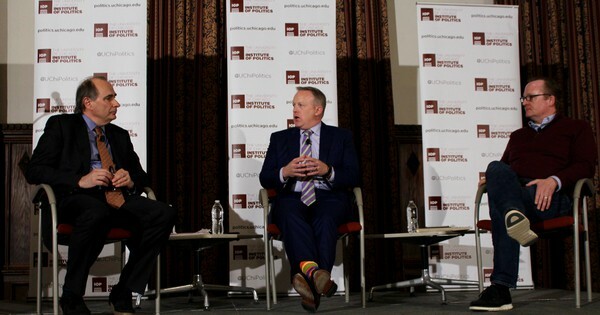 At IOP Event, Trump's Press Secretary Says It Is "Insulting" To Question His Boss's "Desire To Be Truthful"
On Wednesday, the Institute of Politics (IOP) hosted President-elect Donald Trump’s choice for press secretary, Sean Spicer, and President Obama’s first-term press secretary, Robert Gibbs, in conversation with IOP Director David Axelrod. The announcement of the event over winter break drew criticism from students opposed to the incoming Trump administration. Two students who had threatened to disrupt the event in Facebook were called into the Dean of Students’ office last week. At least 10 UCPD officers were stationed around Ida Noyes Hall in preparation for the event, and the two rows nearest Spicer were reserved for members of the College Republicans. After introductions by IOP Executive Director Steve Edwards and second-year Josh Parks, a protester from the anti-Trump organization Refuse Fascism stood up and loudly addressed Spicer. “You are a press secretary for Trump who threatens the press, denies facts, suppresses science…. This is not normal, people,” he said. He was escorted out of the room by University employees. Axelrod, Spicer, and Gibbs (from left to right) discussed the press, press secretaries, and the coming Trump administration. Axelrod asked whether the incoming press secretary knows ahead of time what Trump plans to tweet. Spicer said that while Trump receives input from his advisers, he writes and publishes his own tweets. Spicer dismissed speculations that not all of the tweets come from Trump (because some are posted via Android and some via iPhone), saying that Trump simply uses multiple electronic devices. “The Clinton folks know about that,” he added. He said that although Trump’s tweets may seem impulsive, Trump “is a very, very strategic thinker,” whose tweets are meant to forward his policy goals. The panel next addressed the proliferation of “fake news.” Spicer said that the mainstream media is guilty of publishing “stories that have no intention of seeking out the truth.” He pointed to both the Washington Post and Politico as examples of mainstream news outlets that have published what he considers “fake news.” Spicer referred to an article Politico published earlier this year that reported, based on an anonymous source, that Spicer had denied Twitter CEO Jack Dorsey an invitation to a meeting of tech leaders after Twitter refused to pair a bespoke money bag emoji with the “Crooked Hillary” hashtag. Spicer denied the report, and said the reporter had not reached out to him for comment. Spicer said mainstream reporters were more eager to publish a story than to get the facts straight. When a reporter calls asking for comment on an issue, he said, he often needs more time than he is given to provide a substantive response. “I’m like, it’s gonna take me 40 minutes to look up half these terms,” Spicer said. “Mr. Trump is kind of the clickbait king,” Axelrod responded, to applause. Several students asked Spicer to describe his role as press secretary with regard to the president-elect’s often controversial assertions. “I believe that he fundamentally believes what he says he believes is best for this country, so I think to question somebody’s desire to be truthful is insulting…. My job is to represent his beliefs and articulate them to the press,” Spicer said. “When he says ‘millions of people voted for [Hillary Clinton] illegally,’ I believe that you’re telling me he believes it…but that doesn’t make it truth,” Axelrod replied. Trump has provided no evidence for his claim that illegal voters deprived him of a popular vote majority. Fourth-year and former White House intern Chase Woods asked why the American people should trust Trump. A recording of the event can be viewed here. Spicer appeared on David Axelrod’s podcast, The Axe Files, on Thursday. Due to an editing error, this article originally said that a protester was escorted out of the event by two IOP staffers. The people who escorted him out of the building worked for the University, not the IOP. The Institute of Politics will host president elect Donald Trump’s choice for press secretary, Sean Spicer, for a discussion with IOP Director David Axelrod.